Twelve-year-old Paloma Marquez is a huge fan of the fictional detective with the excellent name of “Lulu Pennywhistle.” Lulu is a Nancy Drew stand-in, a star of an imagined children’s mystery series with lots of pluck and smarts and—as Paloma's mother would say—valor (bravery). 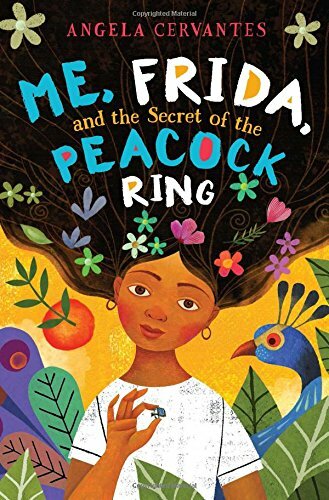 With a mystery-loving main character as the protagonist of Me, Frida, and the Secret of the Peacock Ring, it's no surprise that Paloma herself catches a case in this charming middle grade mystery. The mystery occurs on Paloma's trip to Mexico where her professor mother is on academic assignment. Mexico is a long way from their home among the wheat fields of Kansas, and Paloma experiences a bit of culture shock in this new country. Author Angela Cervantes (whose debut, Gaby, Lost and Found, was honored by the International Latino Book Awards) does an excellent job depicting contemporary Mexico as the setting to the mystery. She describes both rich and poor Mexico and gently weaves together cultural elements such as food and music and art. Art in particular plays a huge part of the story as it is at the Frida Kahlo museum (Frida’s former home, “La Casa Azul”) where the mystery unfolds. Readers get an excellent feel for Kahlo’s paintings and her importance in Mexican culture as Paloma develops her interest in the iconoclastic painter. The mystery kicks off when Frida’s famous peacock ring goes missing, and it's up to Paloma—as well as some new friends she meets at a fancy art party—to solve the case. These new friends are particularly interesting characters—Gael and Lizzie are performers in a mariachi band and rather bold traviesos (troublemakers). Their stubborn search for clues pulls reluctant Paloma into the intrigue and propels the plot nicely. She also befriends (and develops a crush on) the adorable Tavo, the Mexican twelve year old who tutors her in Spanish. As in any good middle grade mystery there are lots of twists and turns as well as some genuinely scary moments. The creepy limping man shuffling his way through the pages is sure to give young readers an enjoyably good scare. Step. Drag. Step. Drag. Step. Drag. The scene where he grabs Paloma by the ankles and she has to struggle for her life is particularly well done. There is also a mysterious Russian fortune teller—what is she doing hanging around Casa Azul? And what of the secret rooms locked inside Frida's home? As a young Mexican American, the visit to the location of her father's birth is emotionally charged, especially because he died when she was very young. The story of the missing ring becomes intertwined with Paloma's family story and allows Cervantes to (gently) probe questions of identity and the second-generation American's search for connectedness. Paloma's relationship with her mother feels very authentic—not always smooth, but always loving and certainly a realistic depiction of contemporary family life. Above all, Paloma has a big heart and readers will root for her on all levels. Me, Frida, and the Secret of the Peacock Ring is a charming mix of intrigue, humor, and character—all adding up to first-rate middle grade mystery. Here’s hoping we’ll see more Paloma Marquez mysteries. She deserves a whole bookshelf for kids to enjoy and be inspired by, just like Lulu Pennywhistle. Josh Berk is an author of children's and young adult fiction. His most recent title is Say It Ain't So (Knopf Books for Young Readers).